The Army Corps of Engineers arrived in the Saginaw River in 1867 to begin dredging a 95' wide by 13' deep channel through the bar at the river mouth in order to open the river to larger vessels. With their completion of the improved channel in 1869, the Saginaw Bay Lighthouse which had been in operation since September 1831 was no longer positioned to adequately to mark the modified river entrance, and the Lighthouse Board recommended to Congress that an appropriation of $12,000 be made for the construction of a set of range lights on the west bank of the river to guide vessels directly into the new river entry. On investigation, it was determined that the optimal location for the new front range light was at a point off the river bank approximately 800 feet to the east of the old light, and that the taller rear range light would need to be constructed inland some 2,330 feet upstream to the southwest. Negotiations began for obtaining clear title to the necessary land for the new structures, however after three years of wrangling with the current owners without success, the appropriation remained unexpended and reverted back to the Treasury Department on June 30, 1871, forcing the Board to request a new appropriation for construction of the ranges. In the years since the original appropriation, it had become clear that both the costs of construction and the purchase of land for the new range lights were going to be considerably higher than originally estimated, and Eleventh District Engineer Major Godfrey Weitzel requested a revised appropriation of $23,000 for the project in his annual report for 1874. That following year, Julia Brawn remarried, and her new husband George Way moved into the lighthouse with her while she continued to serve as Keeper. That same year, Congress appropriated the necessary funds for the construction of the new range lights, however with continuing problems experienced in obtaining clear title to the land unsettled until 1876, work did not begin on the lights until the opening of the season of navigation in May of that year. 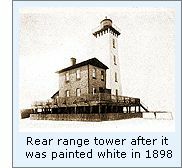 The Front Range Light was constructed atop a square timber crib just off the western river bank, and took the form of a 34 foot tall white painted pyramid timber frame structure similar in design to that being used for pierhead beacons throughout the district at the time. With its upper half sheathed, a small enclosed room was thus created beneath the gallery for the storage of oil and supplies, and in which the Keeper could seek shelter while tending the light during inclement weather conditions. The gallery was surrounded with an iron safety railing and capped with a prefabricated octagonal cast iron lantern. Seated atop a cast iron pedestal within the lantern, the Light's sparkling new fixed white Sixth Order Fresnel lens sat at a focal plane of 37 feet, sending its light 8 ½ miles out into the bay. Eleventh District Engineer Major Godfrey Weitzel's design for the combined rear range tower and dwelling was unique. Consisting of a large elevated concrete base supporting a combined brick dwelling and tower, the swampy ground in the chosen site first required the driving of timber piles deep into the ground to provide a solid foundation on which timber forms for the concrete base could be erected and filled. Atop this concrete foundation, a square two-story Cream City brick keeper's dwelling 26' 6" in plan was constructed. Integrated into the northwest corner of the dwelling, a tapered 53' tall square tower with double walls housed a set of prefabricated cast iron spiral stairs. Winding from the cellar to the lantern, these stairs also serving as the only means of access to the first and second floors by way of landings on each floor, each outfitted with tightly fitting arch-topped iron doors designed to stem the spread of fire between floors. A timber deck supported by timber columns encircled the dwelling at the first floor level, providing easy and dry access to all sides of the structure. The living quarters consisted of a kitchen, parlor and oil storage room on the first floor, and three bedrooms above. The tower was capped with a square iron gallery, supported by five cast iron corbels on each of its four sides. An octagonal cast iron lantern was installed at its center, with a fixed white Fourth Order Fresnel lens placed at a focal plane of 61 feet. Julia, her husband George and her now sixteen year old son Dewitt moved into the new dwelling in the rear range, and exhibited both new lights for the first time on the night of September 15, 1876. With the establishment of the new ranges, the tower of the old Saginaw Bay Light no longer served any purpose and was demolished in order to prevent any confusion to mariners entering the river. 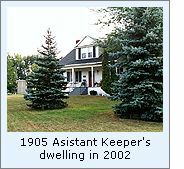 However, the old dwelling was left standing, likely as a dwelling for an Assistant Keeper should one be deemed necessary to tend the Front Range. The need for an Assistant to help tend the two lights of the range was validated on September 11 of the following year, when George Way was appointed to the position of Acting Keeper, and Julia simultaneously demoted to the position of Assistant. The pair continued to tend the light together until 1882, when the Eleventh District office in Detroit eliminated the position of Assistant Keeper at the station, and George took over full official responsibility for both the front and rear ranges. Whether the District office undertook this change in an attempt to pressure George and Julia into resigning, or as an underhanded attempt to reduce costs is undocumented. However, it is likely that some plan was afoot, since on George's death on February 10, 1883, Julia disappeared from lighthouse service and the keeper roster at the station was again increased to include both a Keeper and Assistant. Charlton Leonidus, the new Assistant Keeper arrived at the station on May 25, 1883 and was joined by the new Head Keeper Edward Buzzard on October 16 of that same year. One month after Buzzard's arrival, Leonidus resigned his position, and Buzzard's wife Nellie took over as Assistant. However, the couple were evidently ill-suited to the rigors of lighthouse keeping as they both simultaneously resigned their respective positions after only three years of service at the station on June 3, 1886. The Buzzard's were the last husband and wife team to serve the Ranges, and thereafter Keepers assigned to the station lived in and tended the Rear Range Light, while their Assistants tended the Front Range and took up residence in the old brick dwelling that originally served the old Saginaw Bay Light. By virtue of its location offshore in the river, the timber crib of the Front Range deteriorated considerably as a result of its exposure to constant wave action from passing vessels and ice grinding during the winter months. To rectify the problem, significant repairs were undertaken on the crib over 1889 and 1890. While the Rear Range's location on land some distance from the river bank eliminated the effects of such wave action on the structure itself, the banks of the channel from the river to the Light was beginning to deteriorate and threatened to undermine the structure's foundation. To this end, a number of rotting pilings were replaced and steel sheeting installed as a protection against further erosion in the area around the tower. With population growth in the area upstream from the range in the early nineties, in increasing number of lights were becoming visible during darkness. To eliminate potential confusion, the characteristic of the Rear Range Light was changed from fixed white to fixed red on the night of June 15, 1891. In the mid nineties, waves, ice damage and rot continued to plague the Front Range, and a work crew arrived in 1896 to replace ten layers of the timber support crib. Before leaving, the crew also erected a 625-foot long elevated plank walkway over swampy ground between the Front and Rear Ranges to make passage easier for the keepers. After complaints were heard from maritime interests that the yellowish-gray coloration of the Cream City brick Rear Range tower was indistinguishable from the sky in overcast conditions, the tower was given a coat of bright white paint in 1898. Also in this year it was determined that a large portion of the original Saginaw Bay Lighthouse reservation was no longer necessary for lighthouse purposes, and was sold at auction for $1,500 on May 24. With the dawning of the new century, the old Assistant Keeper's dwelling at the Front Range was sixty years old, and in dire need of repair. 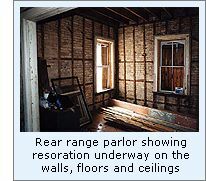 While the kitchen addition recommended by Henry B Miller in 1850 had been built over the intervening years, the walls of the structure were plagued by moisture and were beginning to deteriorate. While complete replacement of the structure was preferred, the west wall was completely replaced as a least cost measure in 1901, along with a re-grading of the grounds and the construction of a plank walkway from the dwelling to the Front Range. At the rear range, moisture was also taking its toll, with the soft Cream City brick found to be spalling badly as a result of moisture within the bricks freezing during the winter. To correct the problem, all badly spalled bricks were replaced, mortar re-pointed, and the entire structure given a half-inch thick coating of Portland cement to protect the soft brick surface against further deterioration. Funds were finally appropriated for the replacement of the decrepit Assistant Keeper's dwelling in 1904, with plans for the two story structure approved by District Engineer Major James G. Warren on November 15, 1904. A contract was awarded for the work, and the work crew arrived with materials to begin construction in May 1905. That same season a crew was dispatched from the Detroit Depot to construct a 515 foot long embankment from the Front Range to the shore and to rebuild the concrete foundation of the Rear Range which had also been found to be deteriorating as a result of moisture penetration. Work on both projects continued through the remainder of the year until the close of the shipping season when conditions became too frigid to continue the work. Work resumed the following spring, with both projects being brought to completion that summer. In 1915, it finally became clear that the ongoing cost of maintaining the wooden crib beneath the Front Range Light was excessive, and plans were put in place to replace the crib with a more permanent concrete pier, and to replace the wooden tower itself with a skeletal steel structure. Simultaneous with this change, it was also decided to electrify both the Front and Rear Ranges by tapping into the city electrical supply, allowing the replacement of the labor intensive kerosene lamps with 100-watt incandescent electric lamps equipped with automatic bulb changers. Work on the new concrete pier at the Front Range began that summer, and on completion a new black painted open-frame skeletal steel tower was erected atop the pier. Capped with a 300 mm lens at a focal plane of 39 feet, the tower was outfitted with an elliptical white slatted daymark to increase visibility of the structure during daylight hours. Work on both the dwelling and Front Range tower was completed by late fall, with the new electric lights in both ranges displayed for the first time on the night of November 28. With electrification, the nightly workload at the station decreased dramatically, and the position of Assistant Keeper was again abolished, this time never to be reinstated. Also considered a maintenance headache due to the effects of constant moisture, the wooden deck, steps and picket fence around the main floor of the Rear Range were replaced with a concrete deck supported by reinforced concrete columns in 1919, and the edge of the deck outfitted with a tubular cast iron safety railing. With the transfer of responsibility of the nation's aids to Navigation to the Cost Guard in 1939, the rear range Light became the main Cost Guard station for the Saginaw River, and by 1954, the illumination of the Rear Range Light was changed to an electrically powered locomotive reflector of 45,000 candlepower with a visible range of 15 miles. 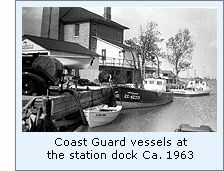 While by this time the station had been equipped with both telephone and radio telephone equipment, the building had never been connected to the city water system, and the Coast Guard crew was forced to transport all their water needs from town in a trailer-mounted 300 gallon tank. With the dredging of an enlarged channel extending eight miles into Saginaw Bay to allow larger freighters to enter the river during the early 1960's, the Ranges no longer served to mark the entrance of the relocated channel, and plans were put in place to construct a new set of steel ranges to mark the channel. With the construction of these mew towers in the early sixties, the lights in the old ranges were permanently discontinued. With the old 1876 Rear Range tower and dwelling still serving as the Coast Guard Station, the old 1915 front range was torn down, leaving only its concrete pier standing at the river's edge, leaving no hint of its former purpose. With an increase in the volume of pleasure boaters moving in and out of the Saginaw during the summer season, the size of the crew assigned to Station Saginaw was increased, and it soon became evident that cramped quarters in the old dwelling and the small dock alongside the structure were wholly insufficient for the purpose. At the close of the 1970's, a site for a new station was selected across the river and slightly upstream from the old Rear Range in Essexville, with construction of the facility completed in December of 1980. The crew moved their vessels, furniture and belongings across the river, and abandoned the old rear Range structure to the elements. The venerable building slowly deteriorated for nine years until Dow Chemical, which owned all of the surrounding property on that side of the river, purchased the structure and reservation in 1989. Dow boarded up the windows and doors in an attempt to keep vandals, bats and birds at bay, and undertook a study in order to identify the predicted costs associated with restoration. With nothing further being done on the building, the Board of Directors of the Saginaw River Maritime Historical Society approached Dow Chemical in the fall of 1999 to see if they could be of any assistance with the project. As a result, an agreement was arranged whereby SRMHS would serve as stewards of the building, providing labor and management, and assisting Dow in the fund raising process. Already under this agreement, members of the SRMHS have completely replaced the roof of the dwelling, all window glass has been replaced and the lighthouse grounds have been cleared and are now maintained in a manicured condition. Additionally, all interior plaster and lath has been removed to expose structural problems which will now be rectified. While the lighthouse property is currently only open to Society members during scheduled work session, the SRMHS hopes eventually to restore the building to a condition in which it can serve as a maritime museum, and looks forward to a day when it can be opened it to the public, so the world can enjoy the historical structure. Click here to see a complete listing of all Saginaw River Light keepers compiled by Phyllis L. Tag of Great Lakes Lighthouse Research. On our first trip to visit this Light, we knew of this lighthouse's existence, but had dim hopes of actually being able to get a photograph of the structure since it is situated on the shore of the Saginaw River in the middle of a huge marshy area owned by the Dow Chemical Company, and completely surrounded by Dow Chemical property. Assuming that our best opportunity would be from across the River in Essexville, we started driving towards Saginaw Bay, turning onto every road that lead towards the River. It soon became clear that there was little hope of any public access to the River along the Eastern shore, since the shore was crammed with industry and junkyards. We finally caught a glimpse of the structure between the trees at the new Coast Guard station, and could see that we needed to head approximately a half mile further towards the Bay in order to be opposite the light. Continuing down an industrial road towards the Bay, our hearts dropped when the road terminated at a guard shack at the perimeter the Consumers Power generating station. Undaunted, I parked the truck, and walked up to the guard shack, explained my mission, and asked the guard if he knew of any place where it might be possible to find a public access to the shore to take some photographs of the old lighthouse. The guard explained that Consumers Power maintains the complex as a wildlife sanctuary, and that he would grant us access to a foot trail that led down to the edge of the river, where we might be able to catch a glimpse of the light. Signing-in, and parking our truck, we made the walk to the shore, and pressed our way through some of the tallest swamp grasses we have ever seen. Bursting out of the grass, and onto the river bank, the abandoned lighthouse could be seen across the river. We were fortunate that weather conditions had been extremely dry for the past year, since it was plain that grasses and the area from which we took the shot would normally have been submerged and impassable. That 500mm lens we purchased in February really helped-out this evening! On our second trip, we arranged to meet two members of the SRMHS at the Light for a tour of the entire station, during which we took most of the photographs shown on this page. The Saginaw River Rear Range Lighthouse is located in on private Dow Chemical property in Bangor Township on the west bank of the Saginaw River (near where the river meets the Saginaw Bay) just north of Bay City, Michigan. 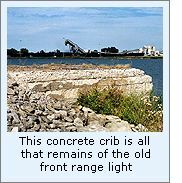 While the Saginaw River Marine Historical Society is working with Dow Chemical to restore the structure, access to the light is presently restricted to members of the Society at this time. To be frank, we were completely lost when we came to guard house at the end of the road when we photographed the Light. Our only suggestion would be that you look for the Consumers Power Plant, and take it from there! History of Saginaw County, Michigan. James Cook Mills, 1898. © Terry Pepper. This page last updated 11/28/2002 .